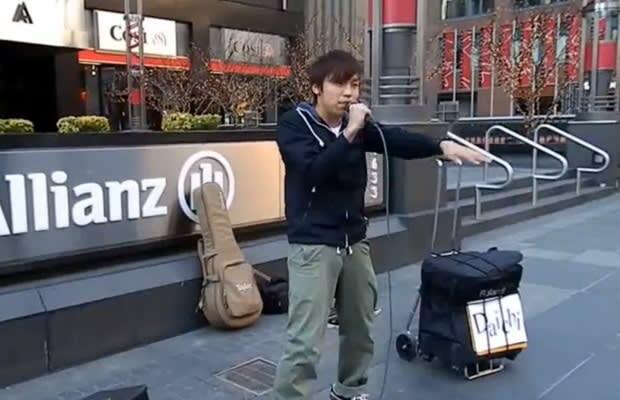 Daichi shows Midtown Manhattan the best beatboxing it's ever seen. For those who've never witnessed a New York City street performance, they often range from bad to annoying. Whether it's the Mariachi band taking over your subway car (Mariachi music is cool, it wasn't meant for sweaty rush hour travel) or the dudes in Washington Square Park who jump over stuff, it's often not the most pleasant expierience. That being said, this man Daichi seems to have it down straight. Invasive? Nope. Talented? Yup. Plus he was able to gather a crowd in New York in the winter, that's pretty impressive.